​Here’s another guilt-free pasta recipe for you! 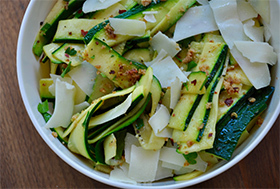 You won’t need a spiral slicer for this one, simply use a regular veggie peeler – like the kind you would use to peel the skin from a potato – to create long, flat zucchini noodles. This recipe has a scrumptious, nutty flavor that will make you forget all about traditional noodles. Feel free to serve with some sliced chicken breast, sliced hard-boiled eggs or steak for added protein. Enjoy!